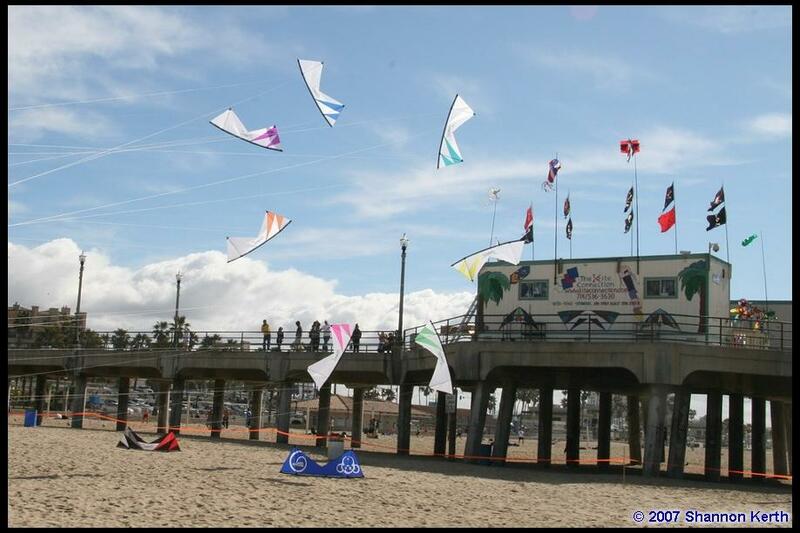 Kite Party Number 5! What more need I say? 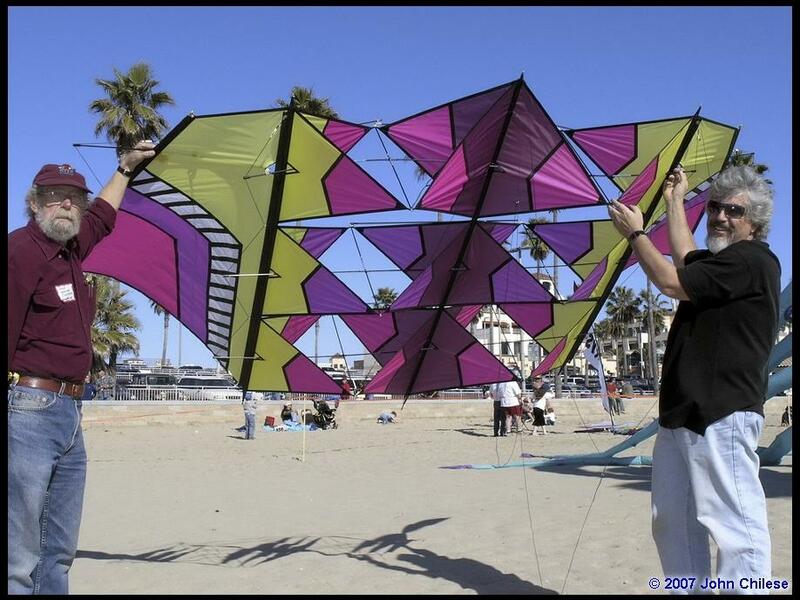 Okay, this is the Fifth Annual Kite Party Dave Shenkman was hosting, so maybe it’s lost a little bit of it’s “Oh My God!” luster that’s associated with “new-ness”… but not very much! And if you really want to rid yourself of the mid-winter “Blahs” (and I had ‘em BAD! ), KP #5 was the place to be! 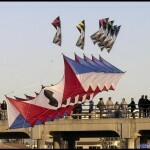 Besides, this year Kite Party had a special meaning for me! 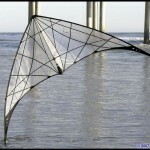 I had a rendezvous with a new (to me) kite – and an old friend! I’d been horn-swaggled into buying a one-of-a-kind single-line Ultralight that Ron Gibian made years ago (actually, it hardly took any effort at all to talk me into buying it). 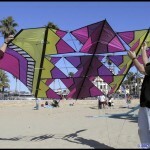 And now, I needed help in assembling and tuning the kite for its first flight on my lines. 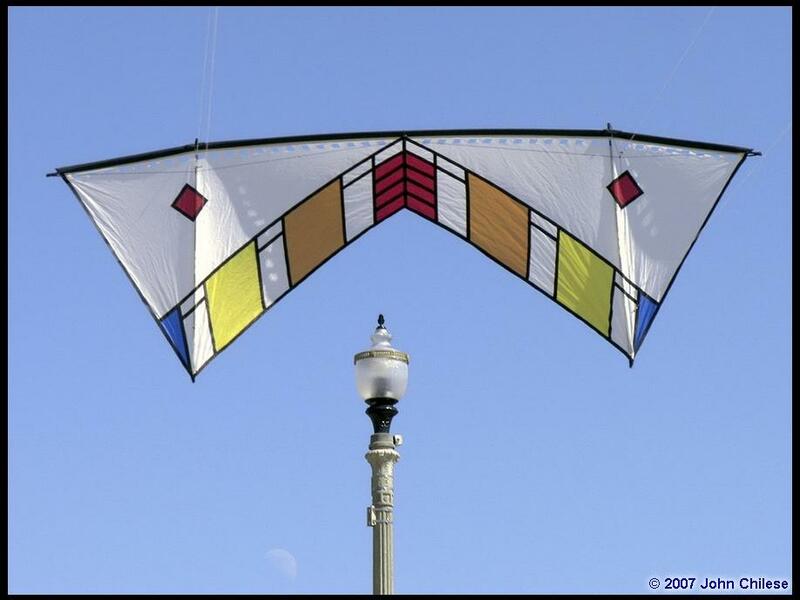 And, judging by the wonderful condition of the kite I purchased, it may have been the kite’s first flight of this century too! 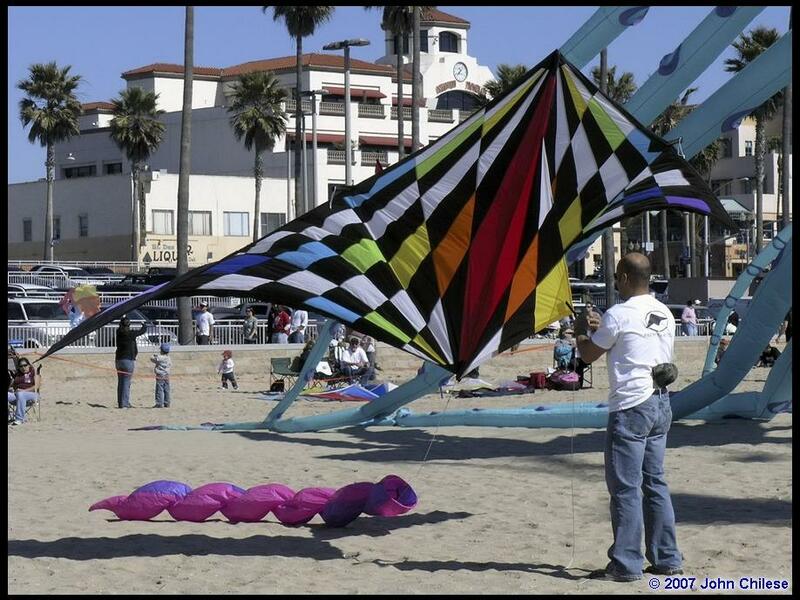 Anyway, an email to Senor Gibian got his attention, and Ron had agreed to meet me in Huntington Beach for Mr. Shenkman’s annual kite-do! 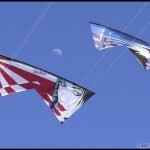 See the separate Zilker Kite Festival Event Report in this issue of Kitelife for particulars. 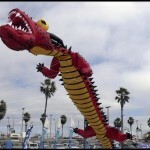 And also on the list of my “potential” stops were seeing Jeff Dubron of Albuquerque, NM, Steve Hall and Chris Miller of Gone With the Wind in Chico, CA, and Amy “Mousie” Doran in Bend, Oregon – Kite-friends, all! 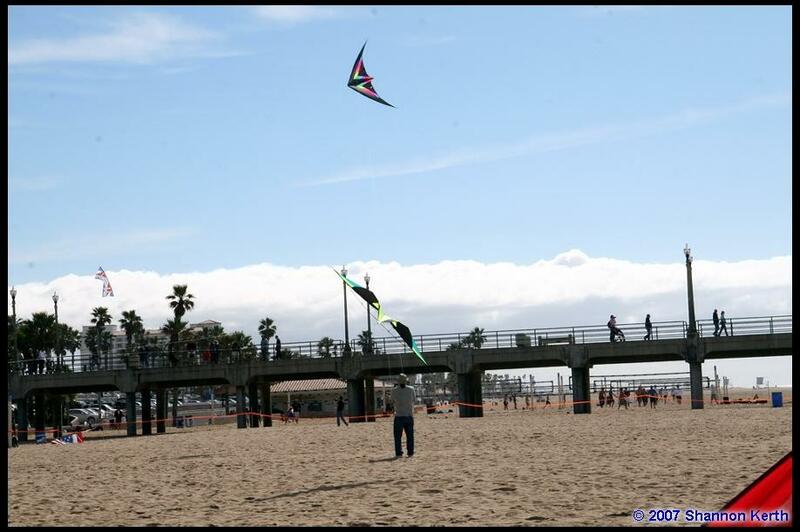 Yeah, kind of a solo “Kite Odyssey” I guess… and I suppose I got a tad carried away! 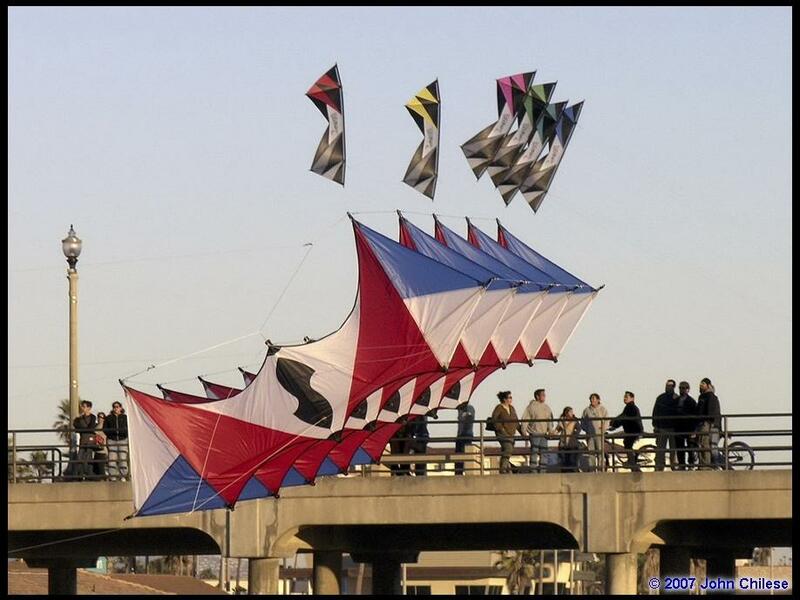 So, with all of this in mind, I packed a mess of kites into the kite-van, loaded a couple weeks of clean clothes, grabbed my cell-phone, travel-mug, and toilet kit – and hit the road on a Tuesday morning. Well, I got all the way from Vancouver, WA to Ashland, OR before I had to stop. Snow was ahead in the passes of the Siskiyou Mountains, and I preferred to drive it in the daytime, thank you. Then it was following snowplows for the first 20 miles the next morning, and I ended up in the tiny berg of Buttonwood, CA that evening – which meant an easy run on into Huntington Beach the following day, and spending Thursday night in the venerable Ho-Jo’s on Beach Boulevard… Yep – a solo breakfast at the Sugar Shack in beautiful downtown HB late the next morning, since I couldn’t find another kiteflier to share a table with. 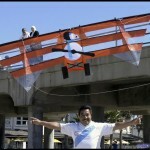 And, by the way – Welcome to Kite Party #5, Geezer! 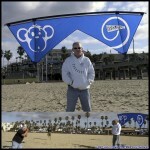 It was the first time I’d seen a SOUTH-West wind at Huntington Beach, and it was kicking up at about 12-15 MPH when I got out there. So, as I was standing and yakking, I heard this “Hold It RIGHT THERE!! !” yelled across the field and I knew without even looking that John “Godfather” Chilese, the venerable Kite Photog Par Excellance, had made it over from Las Vegas. All Right – I was in the right place and the party could start now! Well, I was due to pick Lam Hoac up at the John Waynes Airport in a couple of hours anyway, so I headed for a quick bit to eat at the Shore House, and was in the midst when the cell-phone lit up. Our friend Theresa, and Lam’s landlady, was on the line… Lam’s plane was delayed, and he’d be late – and maybe they’d arrive at some other airport, too – so stay tuned! Swell! Don’t ya love it when you’re able drive the whole length of the West Coast solo, through snow and ice, making it to your selected destination on time – and the guy you’re to pick up at the bloomin’ airport about 15 minutes away, had to climb on a sour airplane – so you’d be stuck hanging around waiting for his (now “unknown”) flight to come in “somewhere” so you could rush off to pick him up? Well, HECK!!! I might just as well head back to Howard Johnson’s and hang out there. Besides, my pals from iQuad must be close to arriving now, so it’s worth a quick check. It turns out that the iQuad team had already arrived, but their rooms did not open on the HoJo’s courtyard like most of the rooms, so I missed spotting them for a while. And about when I finally noticed a couple of them and hooked up with iQuad, my cell phone rang. It was Theresa again, and Lam had finally taken off, but would be very late. Oh, and he’d also talked the airline into giving him a shuttle ride so I wouldn’t have to play “find the airport” in some unknown part of LA after dark. And so Lam eventually showed up, and we all turned in, knowing tomorrow would be a busy day for everyone at Kite Party #5. After a good night’s sleep, everything looked better. The sun was already out, there was a bit of a breeze, and we were off to the beach in fine style. We no sooner got parked and got out on the beach than we got the word that there’d be the usual Kite Party pilot’s meeting shortly. iQuad was already up and flying – working along the south side of the flight area close to the pier, where they would remain all weekend – “playing to the crowd!” So Lam gets his kite bag out and begins to set up, and I just hang out, waiting for the pilot’s meeting to start – which happens within ten minutes of the announcement. 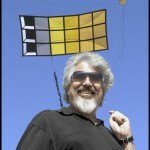 Amazing (apparently Dave Shenkman doesn’t live by “kite time). We go through the usual drill. FLY SAFE! Use short lines. 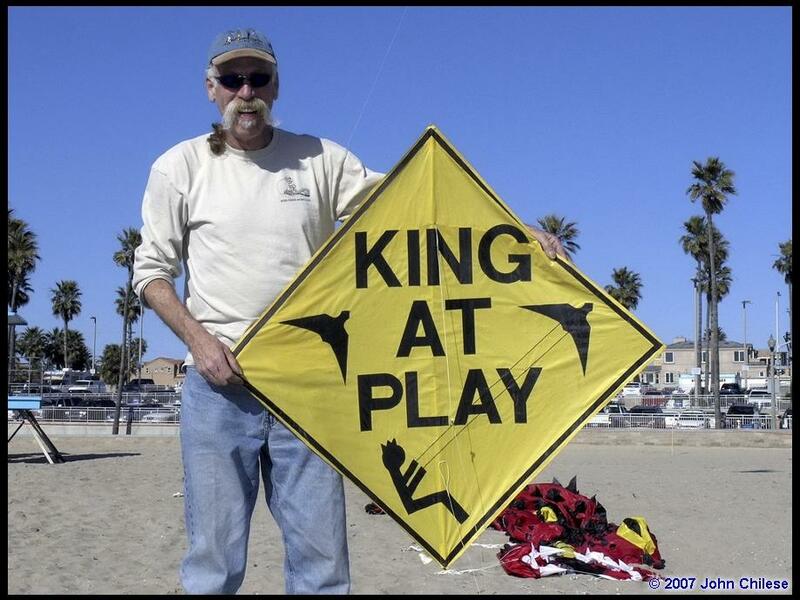 You are responsible for your kite and your gear. BE AWAKE! And – most of all – HAVE FUN! 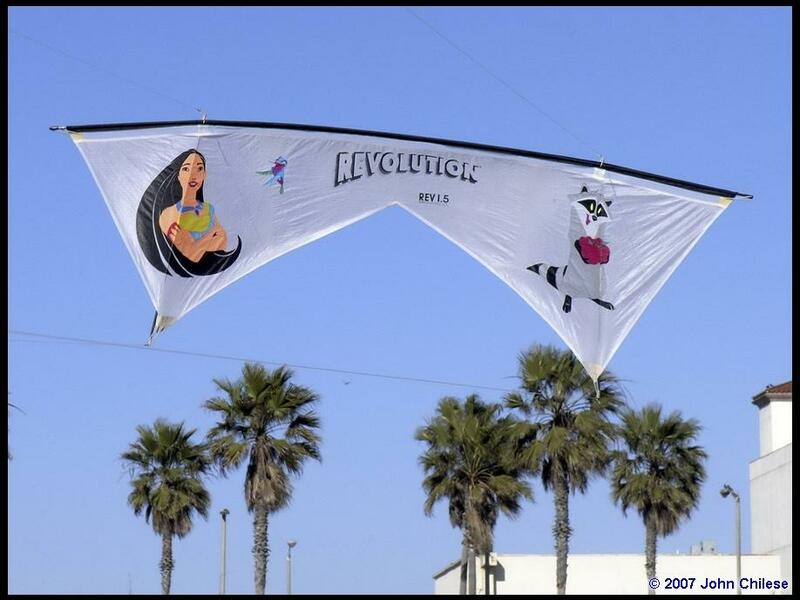 Then it was discovered that Friday was the Birthday of both Mark Reed of Prism Kites, and Ben D’Antonio of Revolution Kites – so we sang “Happy Birthday” twice. 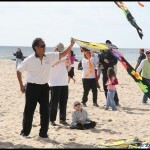 Then everyone introduced themselves, and almost all of us headed toward the beach to fly kites! Me? 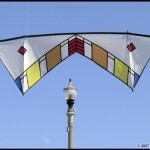 I could wait to fly kites – Coffee comes FIRST, and I’d not had the first mug-full yet. Starbucks, here I come! After the first welcome nuances of caffeine seeped in around the edges, I headed back to the beach, and hunted up Ron Gibian. 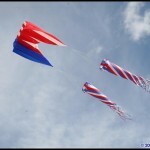 We had a “date” with a kite, after all. 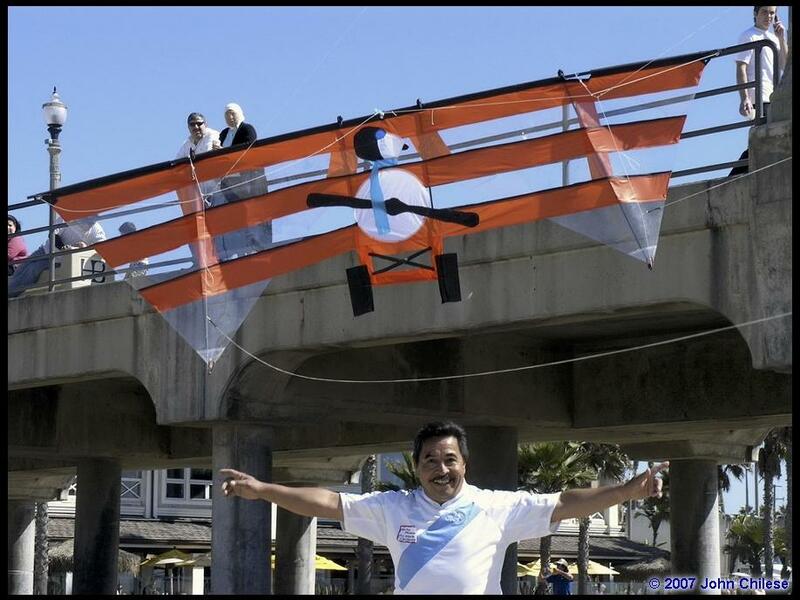 Well, Ron Gibian is probably the nicest, most jovial man on the face of the earth – besides being an extraordinary kite designer/builder, of course. 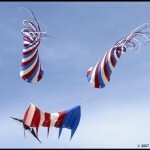 We’d hit it off very well at Kite Party #2, and hadn’t seen each other since for one reason or another! 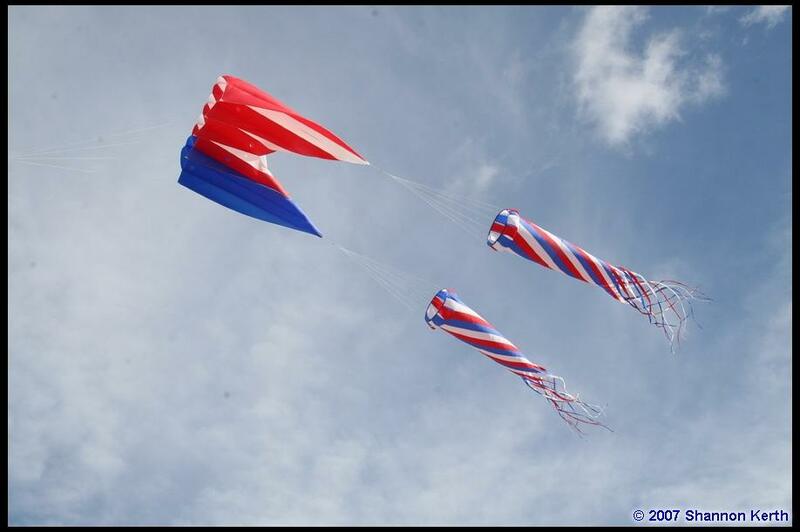 We soon fell into old habits, yakking away at each other, sharing little asides and jokes, watching the goings on over on other parts of the field – and assembling, launching, and tending Ron’s kites. I call it a “habit” but I guess, but we’re really just a couple of guys who’re extremely comfortable with each other, sharing light conversation mixed with kite lore (mostly from Ron) and enough humor and levity to keep about a half a grin on both faces most of the time. 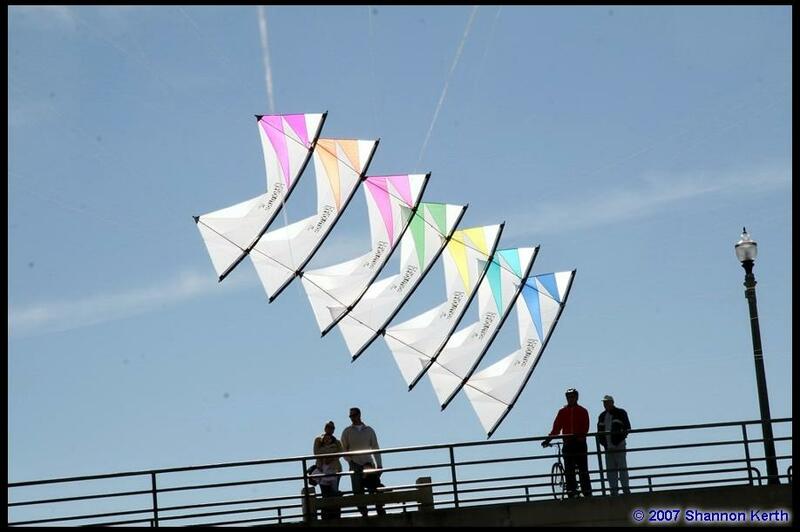 Anyway, Ron and I were beginning to “get organized” when Dave Shenkman came on the PA system and asked that everyone bring their kites to the ground. 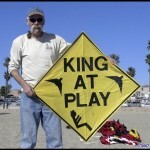 When all kites were grounded, Dave made a very simple announcement. He was very sad to announce that Shane Hill had passed away the previous day, and he asked for a moment of silence in Shane’s memory. Both John Chilese and I were immediately grief-struck, as were others around the field I’m sure, and we all stood silently until Dave said a “Thank You,” and activity slowly began again. I’d first met Shane on this same beach at Kite Party #2, and we’d become pretty good friends later on when we’d both showed up at one of the Gone With The Wind “Spring Open Houses,” up in Chico. Shane Hill had been born with a heart defect that was a life-long disability for him, since his heart did not pump adequate amounts of blood to the right side of his body. He’d been through an incredible number of surgeries to try to correct this defect, and the Docs thought they had it licked after his most recent surgery. 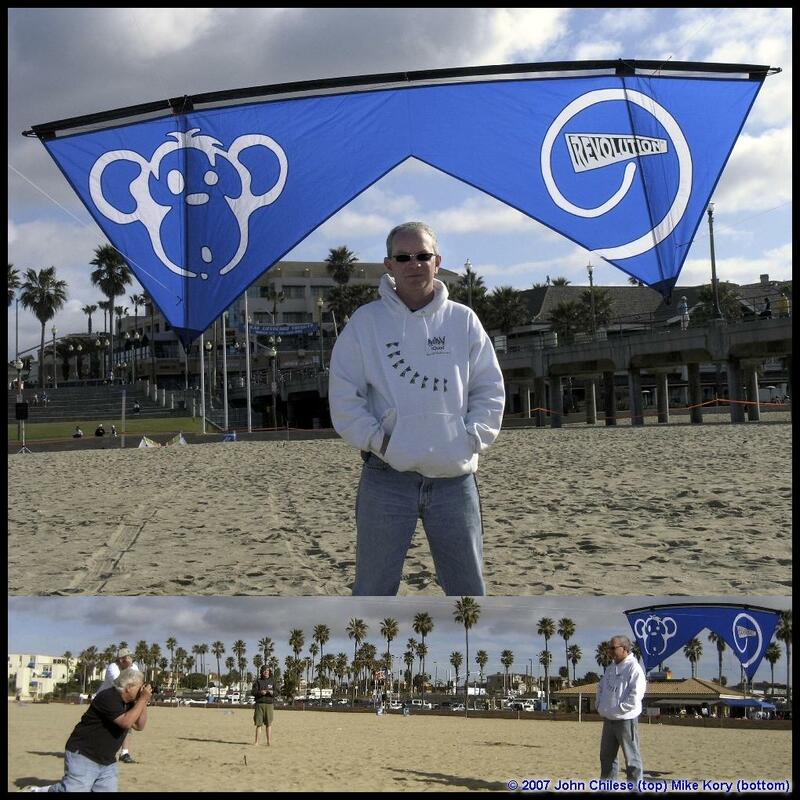 Shane had been an integral part of the US kiting community, both as a flier and as an extremely enthusiastic supporter of the sport. 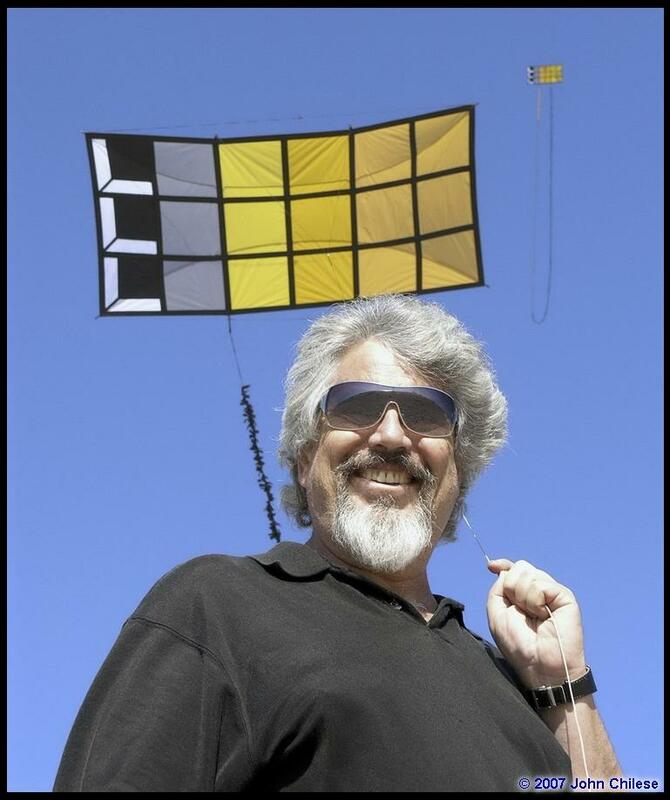 It might have been easy for him to just fly SLKs as his wife Shelly does, but Shane was into the sport kites (he had several custom Aerostars, among other kites). 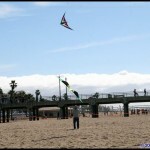 And since his right arm was nearly useless, Shane flew left-handed, using a dual-line handle he’d designed and created for himself – and he’d make his kite do a pretty flat axel with that rig, too. 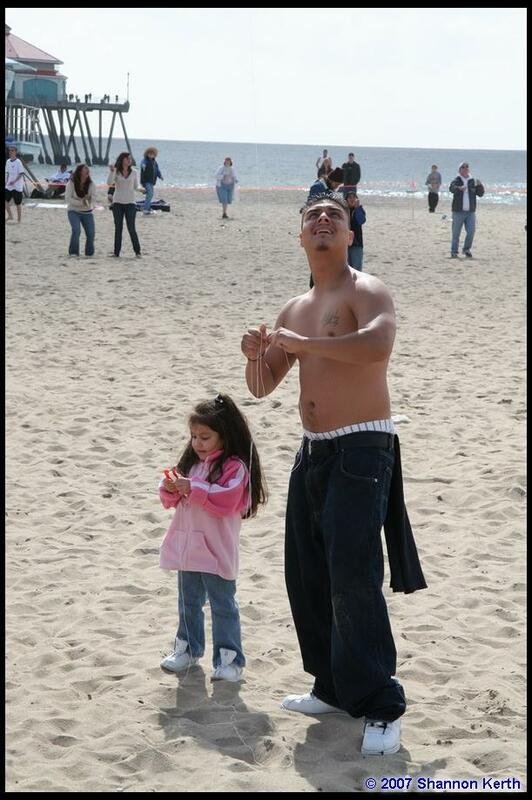 Shane LOVED being at Kite Parties, and certainly would have been with us for this one if he’d been able to do so. 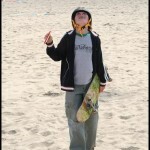 He was loved by kiters up and down the west coast and across this country, and he will be sorely missed by many of us. 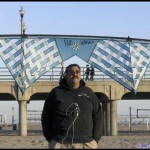 To read Shane’s “Empty Spaces In The Sky” obituary, click here. John Chilese, after dealing with his own grief for a moment, had an entirely appropriate idea. John walked over to iQuad and asked them to form a Cross in the sky in memory of Shane Hill, so nine quad-line pilots, some of them still reeling from the sad news, formed up and flew Shane’s Cross in his honor. Thank you John Chilese, and thank you iQuad Rev pilots. Well, I’d known Shane well enough to know he’d have been the last guy on earth to want a Kite Party stopped on his behalf, so there was nothing to do for it but to go on flying and “partying,” so activity resumed as I stood watching for a few moments. And perhaps some activity would help me too, so I turned back to help Ron get set up and rolling. 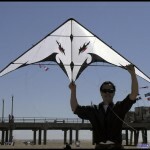 The first kites up in the air were three of Ron’s new orange/yellow/gray small Genkis with long “U” shaped “streamer” tails. They were lovely in the sky – particularly when all three of them were up there together. 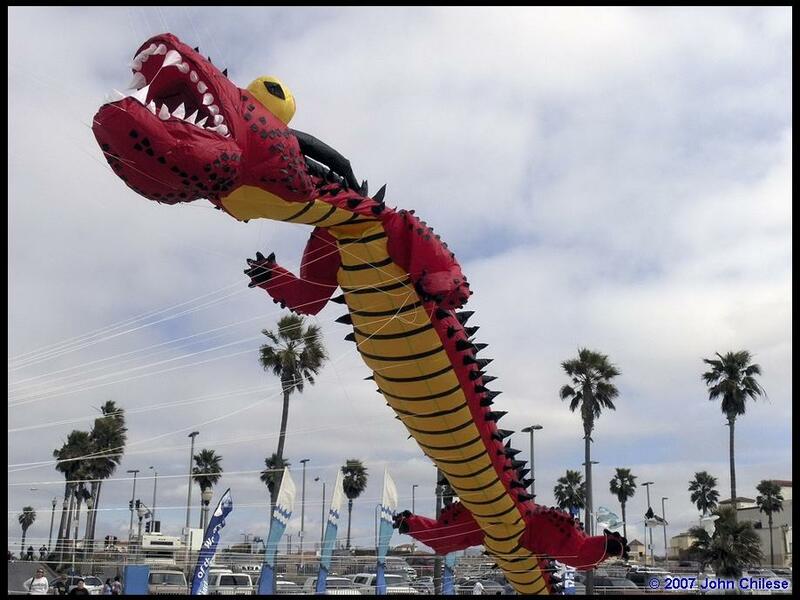 Oh, they danced a bit, and the pitch adjustment on one was a little off, so that one drifted back to earth, asking for a little tweak – but once they had some air on them, they floated up there majestically on their long lines. 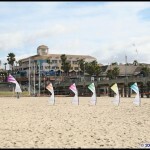 Over across the way, Jim Cosca of Premier Kites was pulling various “samples” out of his bag and filling the air with Premier’s bright collection of kites. 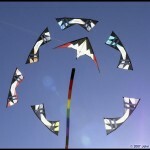 Premier uses very good materials in their kites, almost to the point where they appear to be “over-built,” but that’s a good thing in Single Line Kites (SLKs), and Jim quickly filled his corner of the field with flying color. 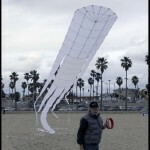 One of his offerings was a gorgeous large delta kite that’s so striking in the air that it almost hurts your eyes to look directly at it – “almost,” but not quite. 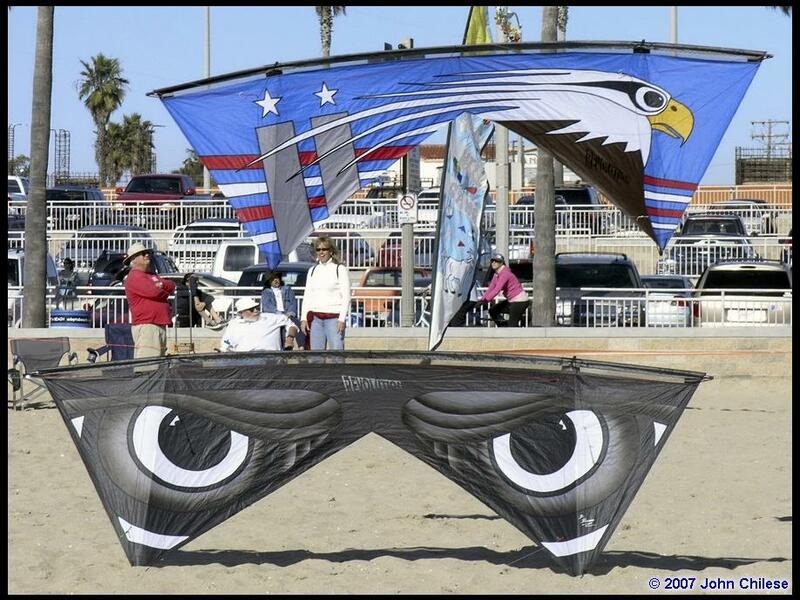 It’s an extraordinarily “bright” kite, and a real eye-catcher because of the sail’s graphics. But the kite that really caught my eye was a predominantly white Angel kite, with one black-striped wing, with both wings billowing and floating on the air. 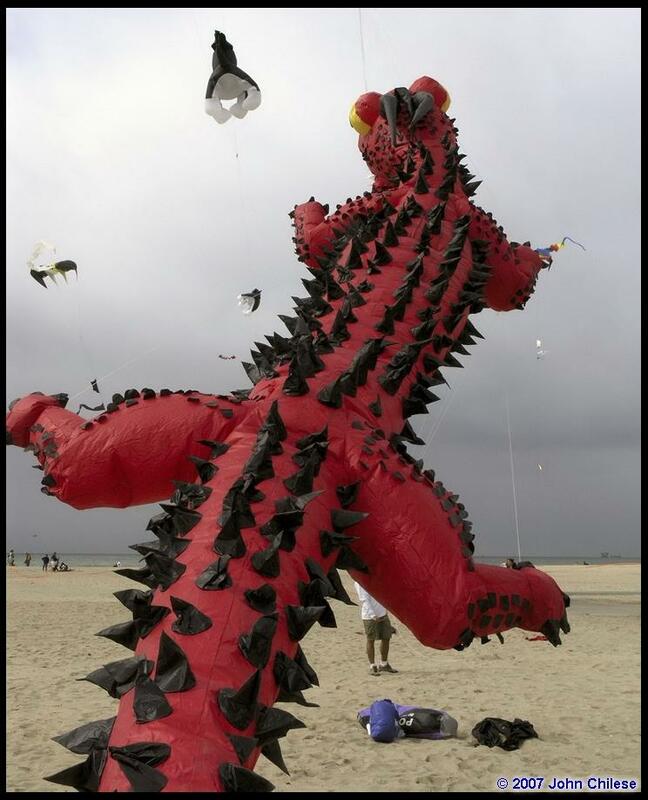 What a marvelous “sky-creature” that kite was, appearing almost “alive.” I quickly determined that I’d have one shortly – to the point where I really considered calling my favorite kite-seller and ordering one from right from the beach! Way across the field, iQuad and the other quad-liners are back aloft, “holding court” along the pier next to (and around) Dave Shenkman’s shop. 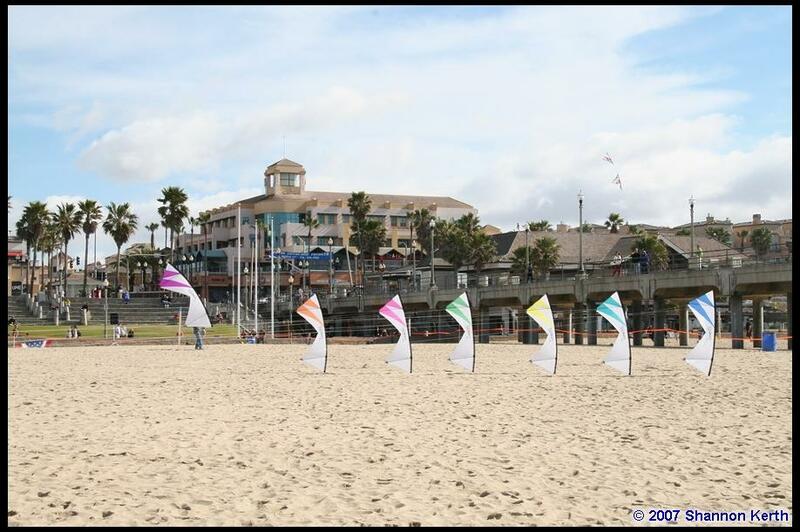 They would continue to use that portion of the beach for the entire weekend, playing to the crowd along the pier and delighting everyone. 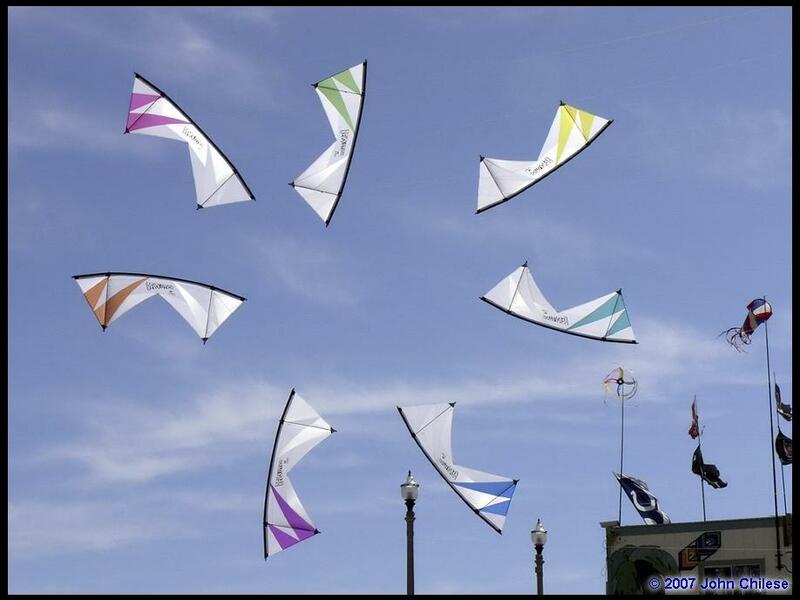 The iQuad team-kites are VERY striking in the air, and grab anyone’s eye – and iQuad is NOT particularly afraid to “play with” the folks in the audience one bit. 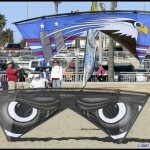 So iQuad “worked the crowd” to perfection for the most part – all under the watchful eye of one of their chief sponsors, Ben D’Antonio of Revolution kites, who was flying his own Rev 1.5 about 75 feet away. 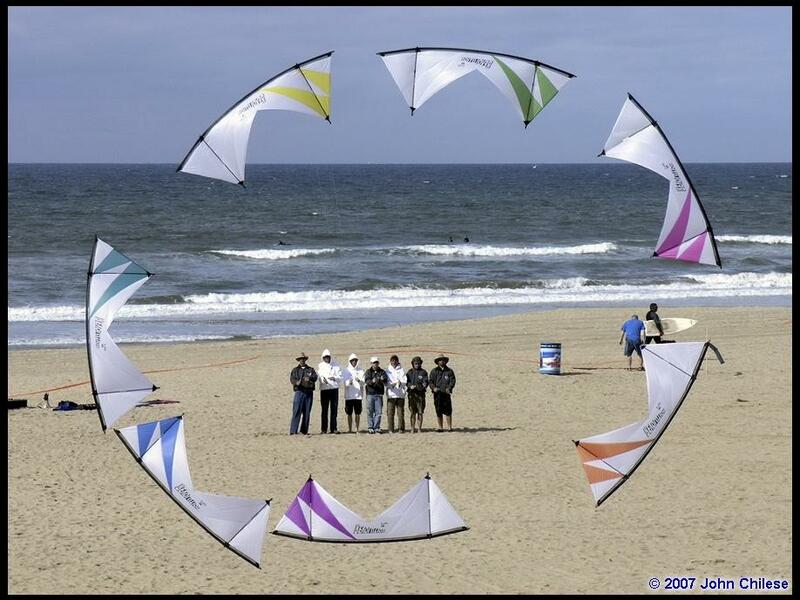 And, out in the middle of the beach, all of the “dualie” sport kiters are busily tricking their kite-of-choice and having a ball. Alex Herzog is out there, and I think I saw Isaac Trejio too. Cal Yuen was there for sure, along with Chuck Harris, and John Rollins. 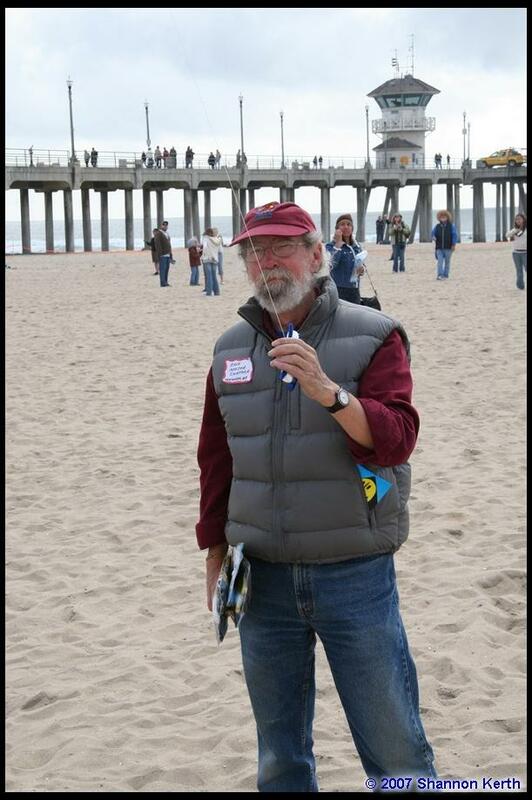 And Mike Macdonald was out there playing with all the “oldies” in the world – even some I wish I owned! 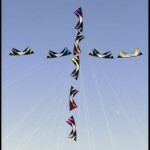 And I’d have loved to dig through Cory Jensen’s kitebag! 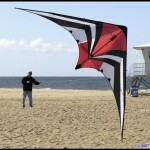 Jon Trennepohl is out there too, dragging different kites out of his bag and flying them – a vented Delta Drive and a Freestylist certainly, and I think I saw an ADX once or twice, and even Jon’s new offering – the Venomous! 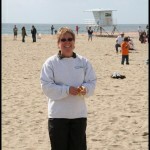 (Meanwhile, Marieanne is over on the sidelines simply enjoying the sun and the warmth of not being back in Michigan.) 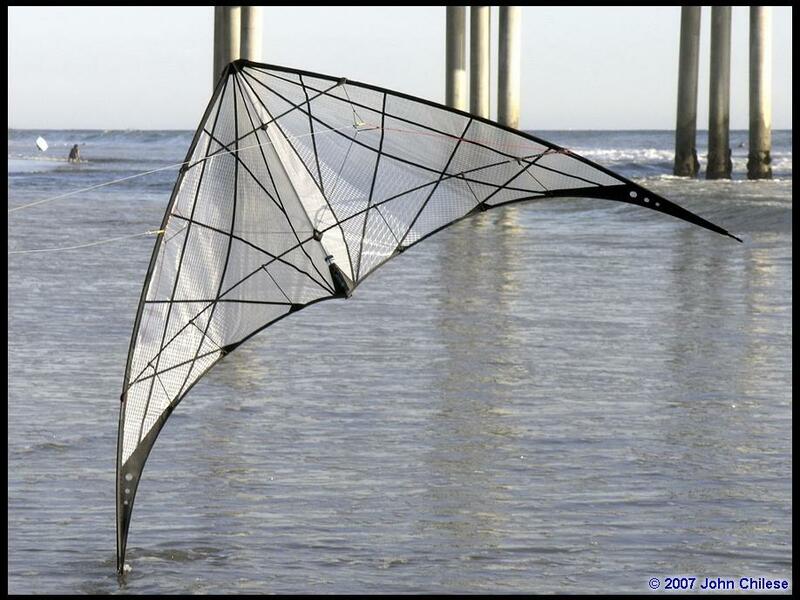 Mark Reed offered up a QP (Quantum Pro) a time or two, but also had the pretty new Zephyr out and Lam Hoac had three prototypes with him, one (or more) of which he calls “Fearless,” and Lam also displayed a Sea Devil or two later on. 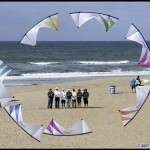 So several of the “dualie” jocks took turns giving most of these kites a run, just to get the feel of them. 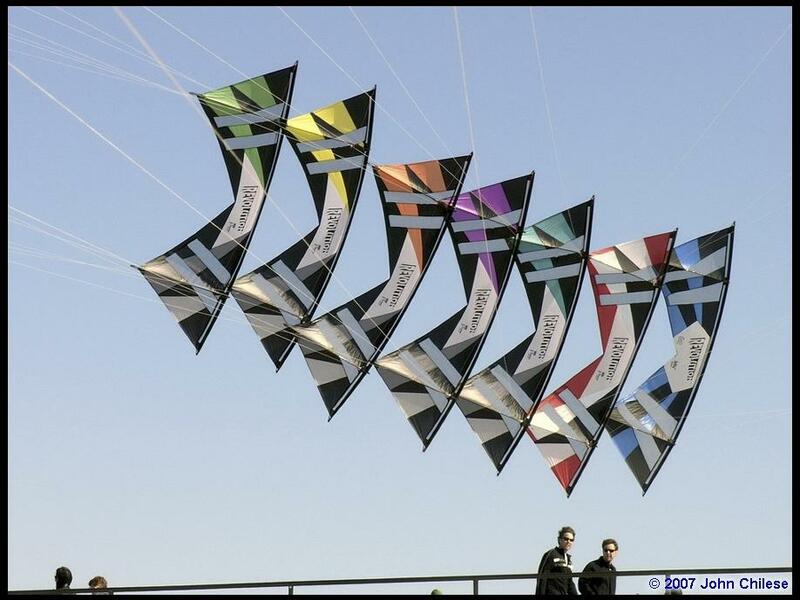 Nope, I know of nobody buying and nobody selling, but there is always definite interest in the new offerings and the available OPKs (other people’s kites) these folks fly at Kite Parties. 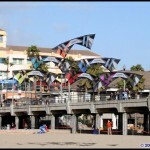 And you never know how many kites happen find their way from one kitebag to another over dinner or breakfast tables and out on HoJo’s balconies, either. 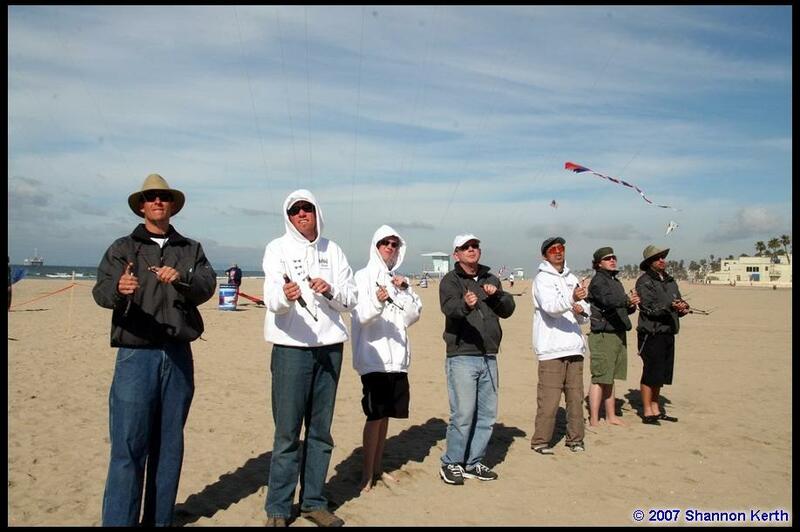 Still, in a way it was kind of sad to see so few of the prior Kite Party “regulars” out there. 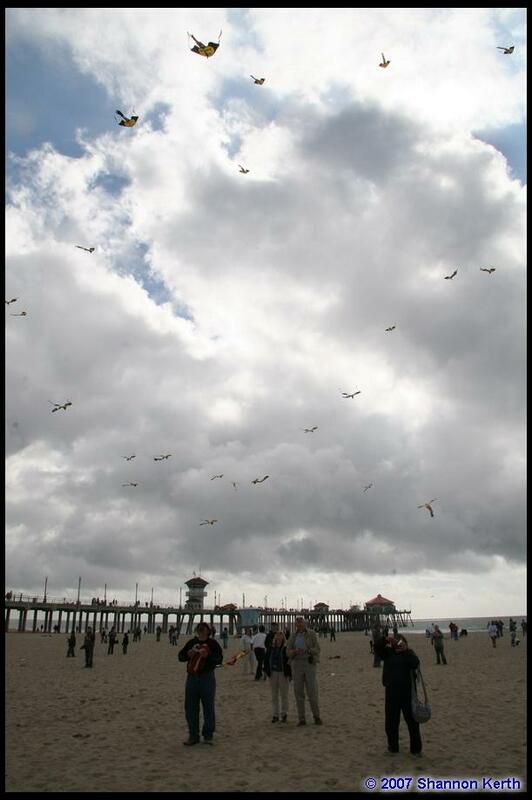 While there was plenty of flying activity, it just felt like there was more “room” out on the sands of Huntington Beach this year. 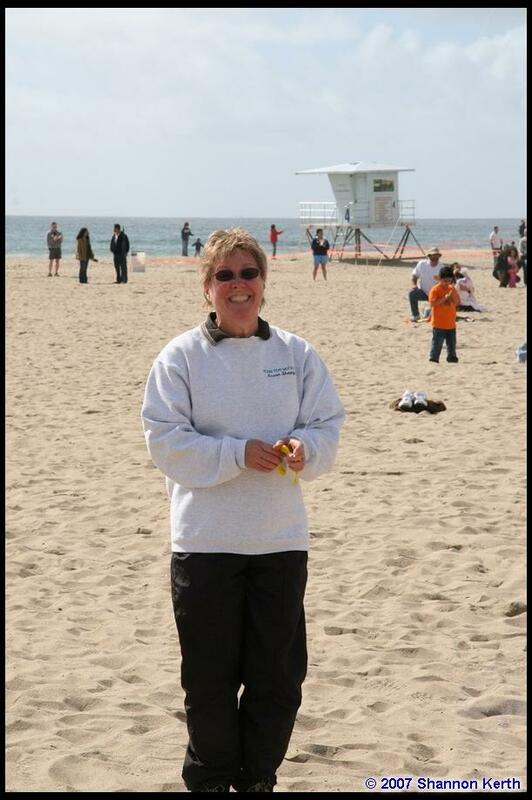 Missing, besides Shane, were folks I’d loved seeing out on that beach in the past like Shawn and Patty Tinkham, and Ron Graziano and Steve Brown and Brian and Aaron Champie and John Gillespie. 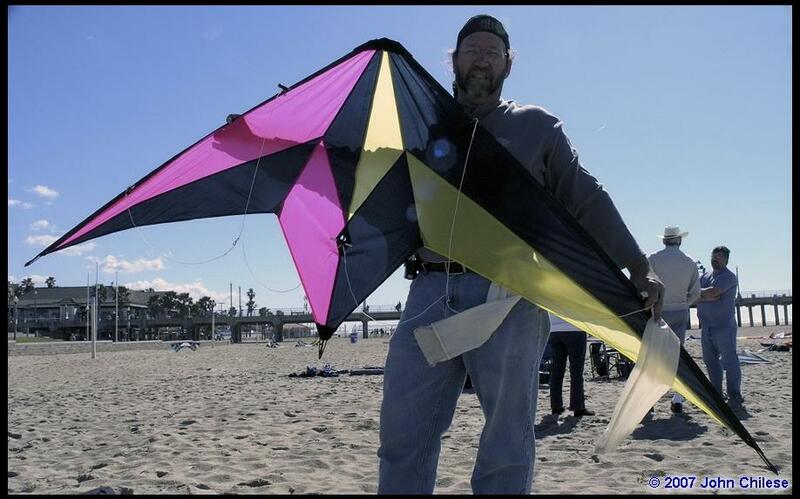 And we certainly missed some of the hoped-for kite builders too – folks like Ken McNeil and Paul Shirey and Tim Benson and Andy Wardley – all of whom had flown this beach before. 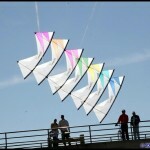 I won’t say that Kite Party #5 was less fun, or even less interesting – but Dave Shenkman does such a bang-up job in creating this event, it’s a shame it wasn’t better attended this year. 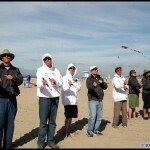 Bless you, Dave – and we ARE certainly very grateful for what you do for kiting and for our community! Anyway, I’ve kind of painted the picture of Saturday morning and into the early afternoon. 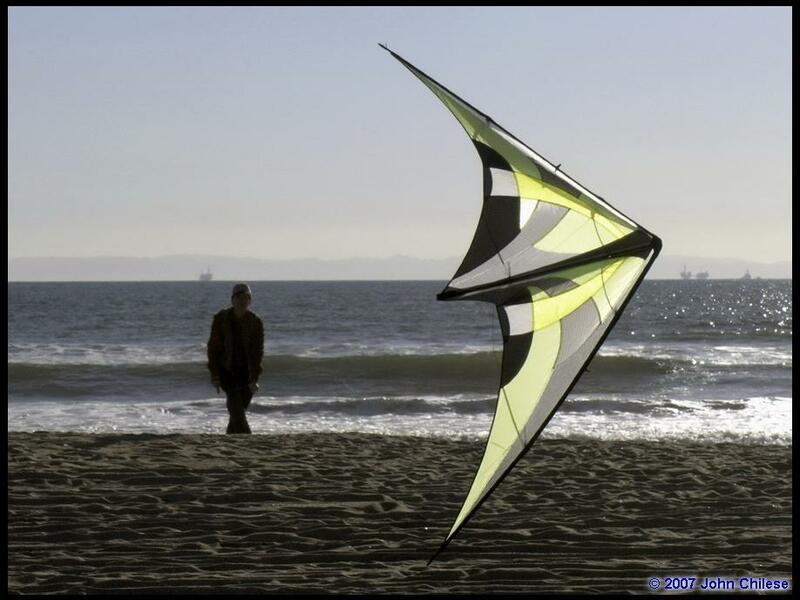 Finally, Ron Gibian looks over at me and says, “Well… where’s that kite?” He’s referring, of course, to the big Ultralight of his that I’d purchased. 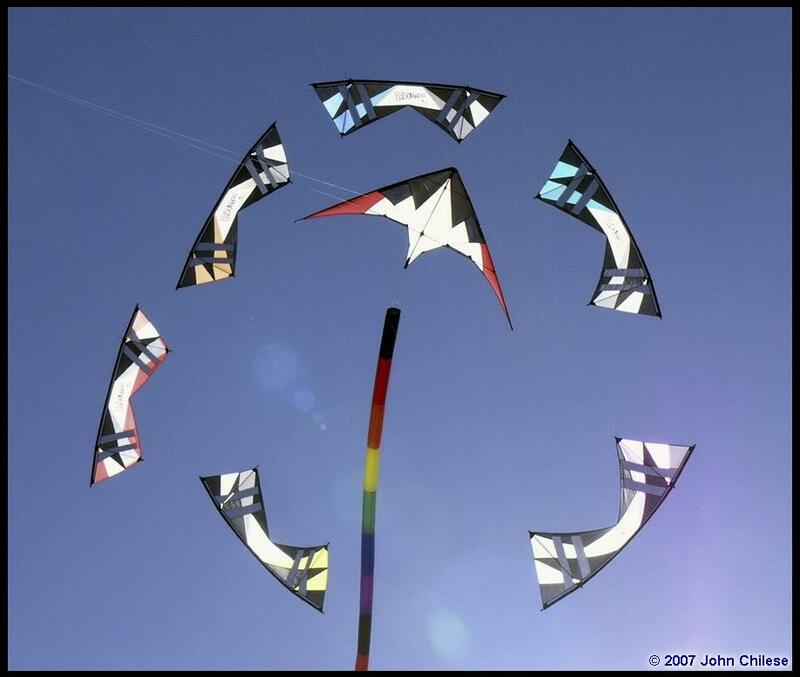 So I went off to the kite-van to get it and we started “the process.” It’s a lovely kite, but boy, does its assembly take some time. I thought Barry Poulter’s Commets were tough to assemble, but this one is at least as complex – and probably more so. Well, Ron took his time on the assembly and walked me through it – yes, including the adjustments. Sure – I think I can put this one together again. 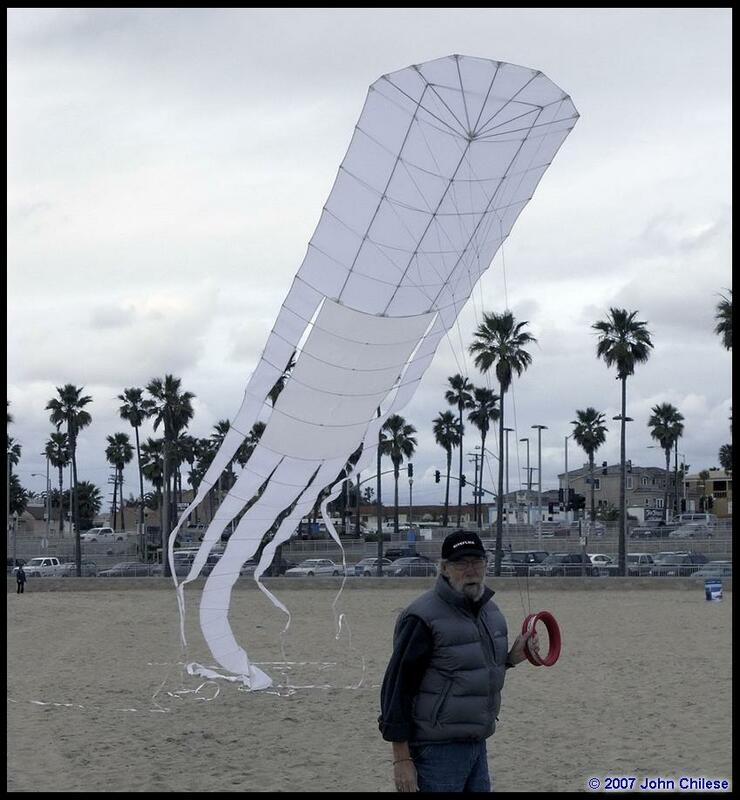 It eventually got to looking pretty good, so I dug out some flight line and we got ready… Then it was launch (and pray) time, and the old kite we’d begun calling “Renaissance” finally took to the air again, and flew like the pure thoroughbred I believe her to be. Gosh, what a feeling! You hope and dream, then buy something you think is pretty good, and then you nurture that beast back into the air with more hopes and more dreams and blessings and prayers. Yeah – she flew, both well and steadily, so I headed for the car, grabbed my own camera, and banged off a few shots of her first flight, well – from my kitebag anyway! It was quite a lovely, gorgeous feeling to see this beautiful old bird flying back into those blue skies again. And, as I was packing up the last of the Renaissance flight gear, I had a “visit.” Little Benjamin Lummas is five years old, and has been a “fixture” in the kiting community almost since birth. His parents, Mark and Jeanette, are world-class pilots, and currently perform dualie pairs together as “Bi-Dance,” and are half of Team Too Much Fun. 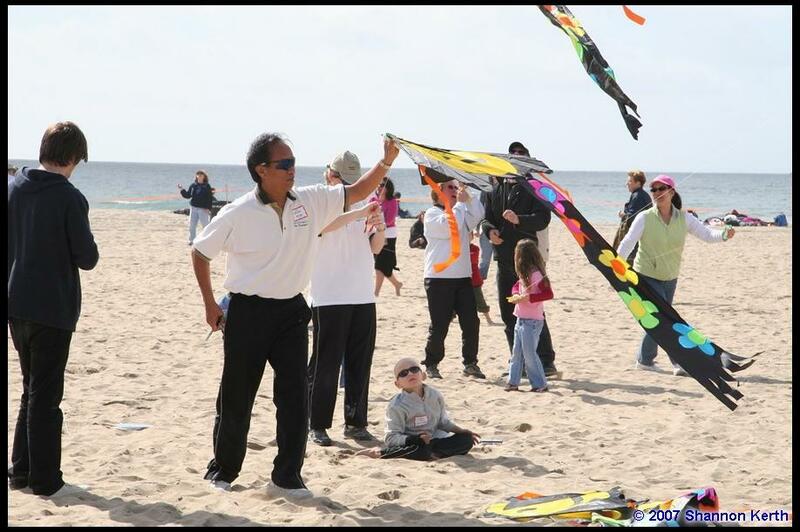 Ben has always traveled with them whenever they perform, and he’s such a charming little guy that he’s loved by the entire kiting community wherever he goes. So, I looked up when I heard an “I don’t KNOW you!” from young Ben. Well, I told Ben that I knew him, and had first met him when he was merely two years old on these very sands. “Oh,” he said. “I’m out here looking for Ronnie. Have you seen him?” I pointed over toward Ron Gibian – who noticed Ben about the same time I pointed toward Ron. “Benjie!! !” hollered Ron, and both of them rushed across the sand to each other for a big hug, and the reunion of a couple of old pals. 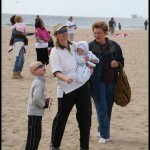 Young Ben Lummas has bone marrow cancer. 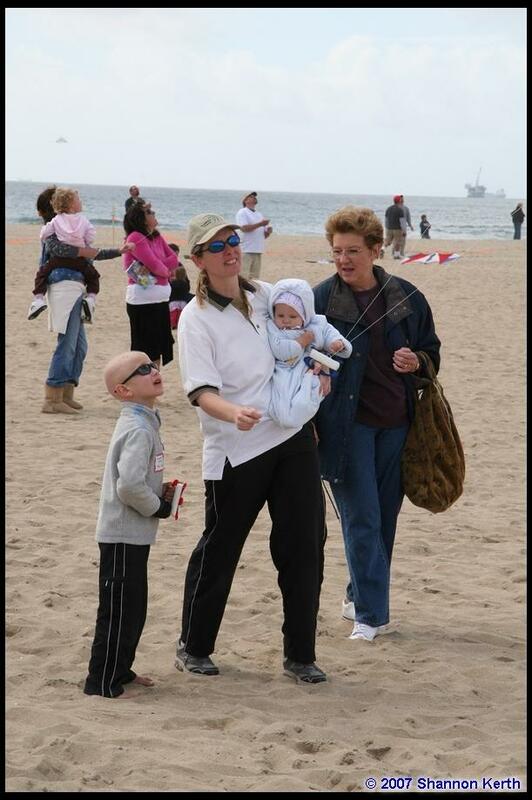 He has been through three chemotherapy treatments by now, and we would hear much more about Ben Lummas before Kite Party #5 was over! After I’d played with the camera, mostly shooting iQuad, I headed back over toward the SLK field, where Sir Gibian had another of his custom creations up and flying in maybe 12-15 MPH winds. 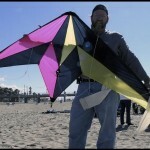 “Dawn Star” is one of his high-wind kites, and so we stood and flew this lovely gem and continued our conversations in the waning afternoon sun until it was time to pack up and head for the “pizza party” and kite-auction at a local restaurant. 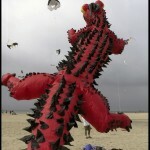 The hard part was getting my roommate at Kite Party, Lam Hoac, off the beach. Lam was apparently having too much fun to leave, so with a stop at the HoJos for a quick shower, we were a bit late getting to dinner. If you’ve not been to one of Dave’s Kite Party functions, you should know that Dave auctions off a good variety of kites at Kite Party. 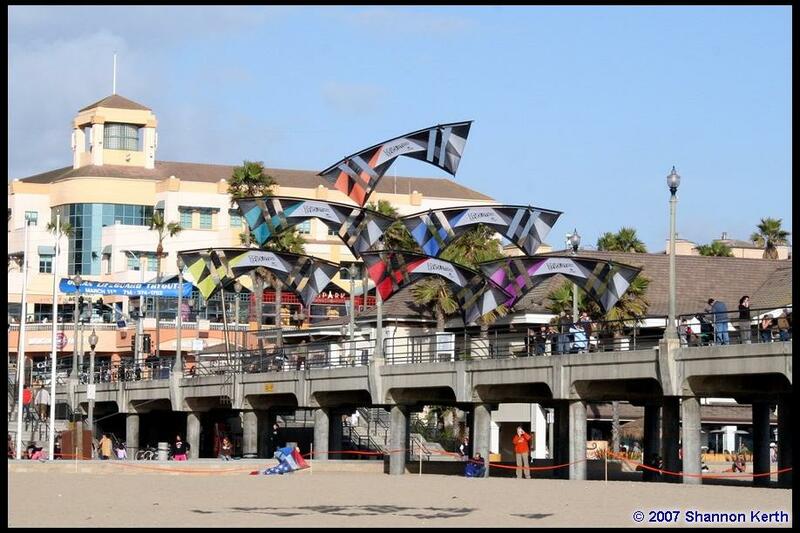 These auctions normally occur right on the beach, but Dave would hold his auction at dinner tonight – so if you want to buy a darned good kite at Kite Party, you either be there for the auction or go home empty-handed. 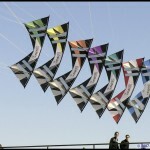 Therefore, we had the proverbial “Full House.” And, by the way, these kites Dave sells are usually the “quality” stuff. Sure, some are last year’s stock, but some are just in from the manufacturer too – and they’re all first-class offerings. 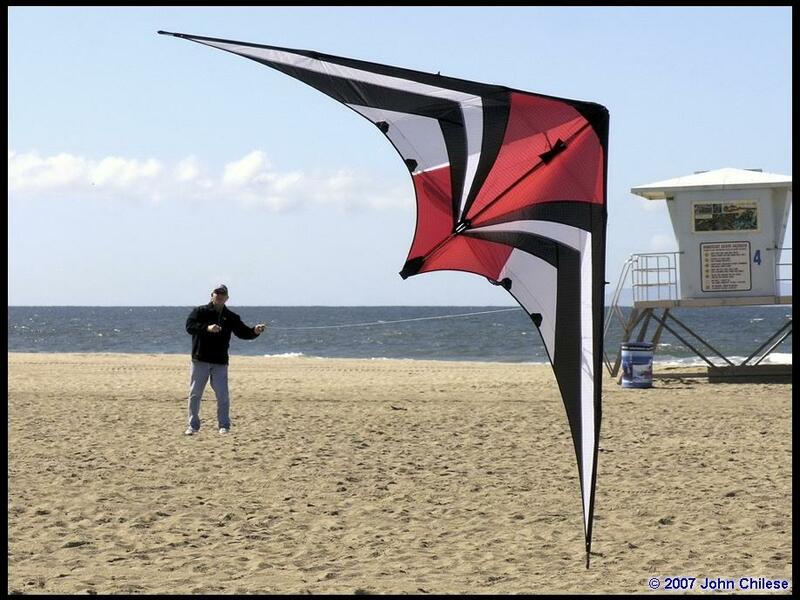 I ended up buying one of Premier’s Red Warrior Serugas at auction, and was delighted with both the kite and the reduced amount I paid for it at auction. Then it was home to HoJo’s again, where I ended up spending time in the room shared by Jim Cosca and Ron Gibian, drinking tequila with Jim, Ron, and Mark Reed. PLEASE do not think the tequila had much effect on the pleasantness of my evening, since I only had a single shot. 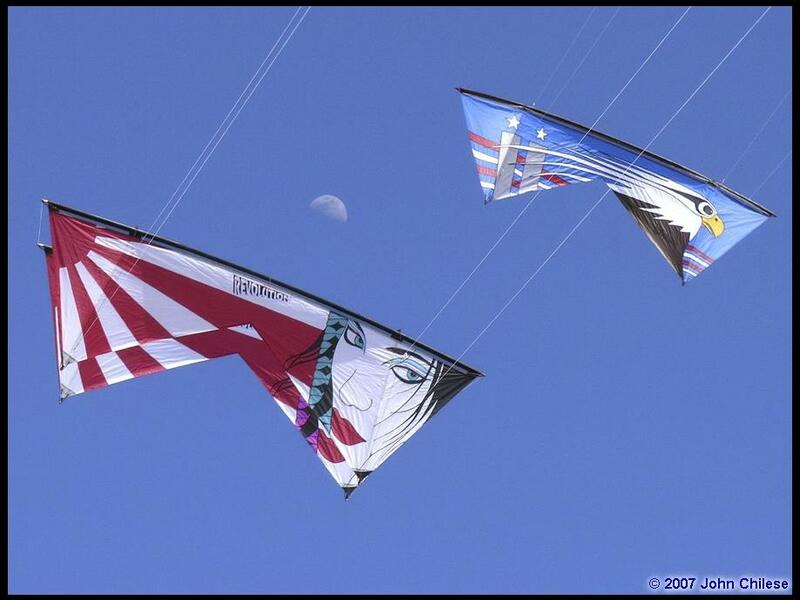 Think instead of the enjoyment of spending time talking about the kite business with these three very knowledgeable gentlemen. It was a very nice time, and it was certainly my delight to be invited to share it with them. 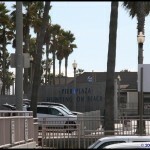 Sunday morning broke bright and clear in Huntington Beach. And how many times a year could I write those very same words about that city, I wonder? 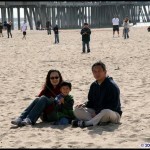 Anyway, Lam and I headed off to the beach to start our day. More sunshine – and more coffee! 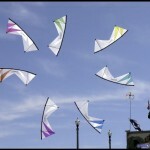 Sundays at Kite Party are like those at any other “free fly” kite affair. Some people are leaving early to catch flights, while others want to hang on for that last full day of perfect lab-grade winds, and there’re always a few others who’ve gotten the word late so just drop in to catch whatever’s left of the action. Yeah – confusing, I know, but that’s the way they happen. So rather than give you a blow-by-blow account of events as they unfolded, I’ll merely list some (not all) of the incidents. Besides, I want to spend some time on the ONE BIG EVENT that occurred toward of the day. The first thing that caught my eye was the “Flight of the Three Gems.” John Chilese had won an all-white Gemini at last night’s auction. 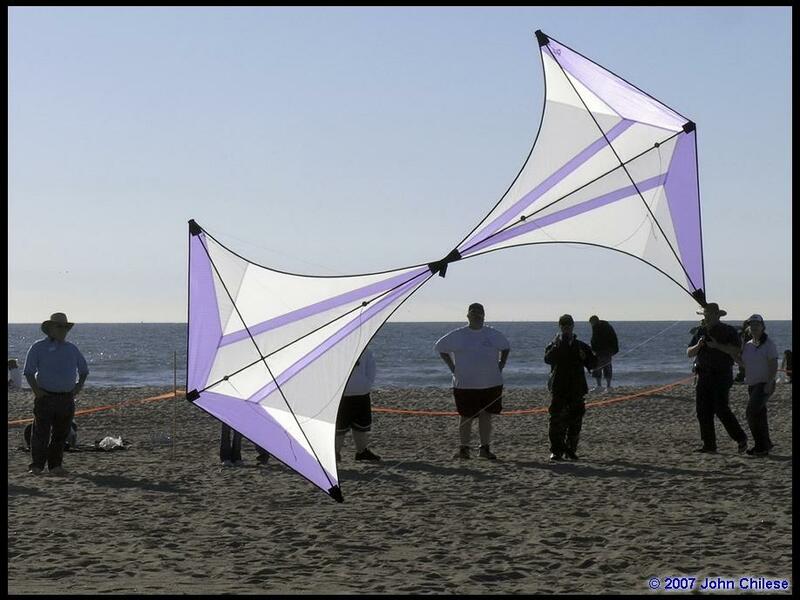 Actually, Cory Jensen actually won the auction, but immediately sold it to Chilese for $20 less than he paid for it, IF John would disassemble and roll up the kite, since Cory said he HATED to un-frame and store that particular kite. 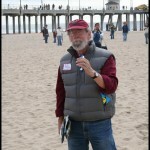 Jim Strealy had won an all-black Gem fair and square! (Told ya Dave’s auctions were good ones!) Well, Donna Houchins had brought her own all-white Gemini with her – so the three of them decided on a “Monochrome Gemini” fly. 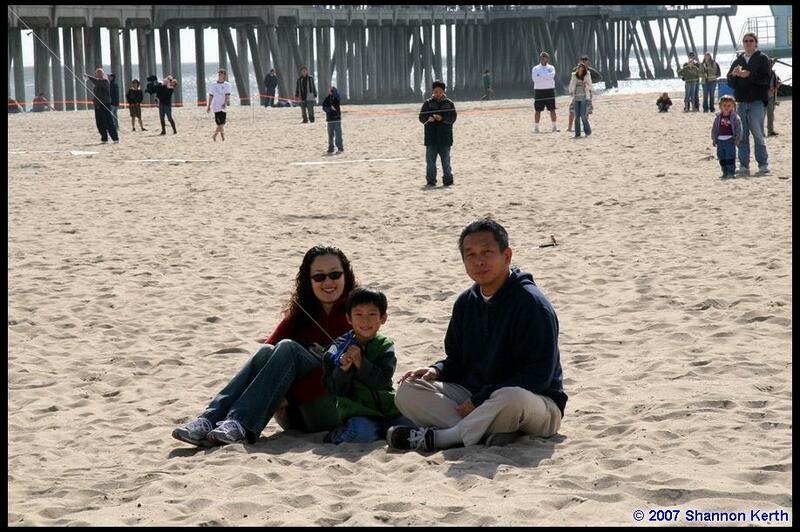 Good photo-op – except that John Chilese (the official, unofficial photographer) was busy flying his (Cory’s ?) new Gem, so George Halpin took the shots instead. 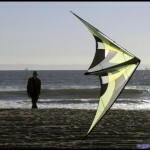 David Hathaway brought out his brand new “Monkey-Boy” Rev 1.5. This is a custom-made 1.5, and was a gift for “Monkey” from Amy “Mousie” Doran. 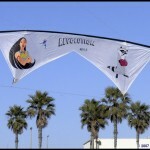 And we were treated to several more of Hector Herrera’s marvelous Rev creations. 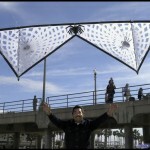 I’d not met Hector before, but he had several hand-made quad-line creations to excite and delight the onlookers. And Sunday was also the day for the big “Rev Mega-Fly!” It’s something the iQuad team always loves to do, since they get to fly in a BIG pack of Revs – and the non-iQuad folks like to fly with the team instead of just watching all the time – and the onlookers delight in seeing twice as many Rev 1.5s in the air than they’ve seen before – so the whole Rev Mega-Fly concept works for everybody. Good Show, folks! And then there was Rachel’s Quantum Pro! Rachael (sorry, but I have no last name for Rachael) is a Research Physicist at UC Irvine, and owns a lovely purple Prism Quantum Pro. 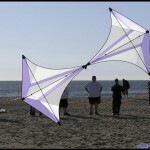 What’s interesting about the kite is that she’s had her own custom fittings machined specifically for her kite. No run-of-the-mill APA fittings and black zip-ties for this lady. Everything is custom-made and perfectly fitted. 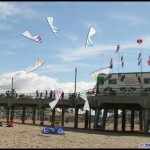 And – for whatever its worth – both the kite and the lady are lovely! 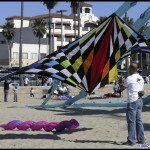 Now, in case you’re not noticed, Dave Shenkman does a superb job of “organizing” these Kite Parties. Oh, I know, he claims there is NO organization – that it’s all “free-fly” time for the participants – but that’s only “mostly” true. There are always a few Demos, where specific invitees perform in front of both the assembled pilots and the crowd-at-large. This year, iQuad had maybe 4 Demos all told, which only means that they performed with music instead of just putting on an ad hoc show for the crowd watching from the Huntington Beach Pier. 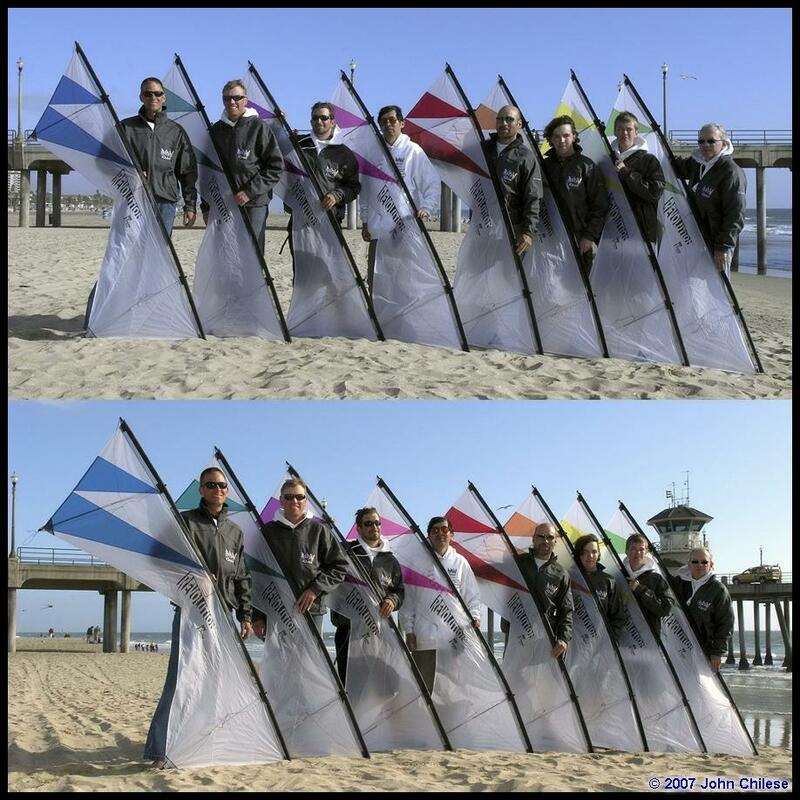 But Dave broke into Sunday afternoon with Demos from iQuad, and later on we saw Team “Too Much Fun” (Mark and Jeanette Lummas, Ron Despajado, and Susan Shampo) fly their amazing routine, which features both dual-line and quad-line kites flown in the same routine. 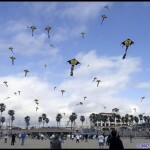 “Too Much Fun” is still just an amazing delight to watch – such beautiful control and precision (of course, every one of the members has been a Precision Champion during their kiting careers). Immediately after Too Much Fun, we watched pairs-team Bi-Dance (Mark and Jeanette Lummas again, this time as a dual-line pairs team). Followed by – – – a Demo performance by 5 year-old Ben Lummas! And it was ALL good stuff, and I do believe that Ben received the loudest round of applause of all. 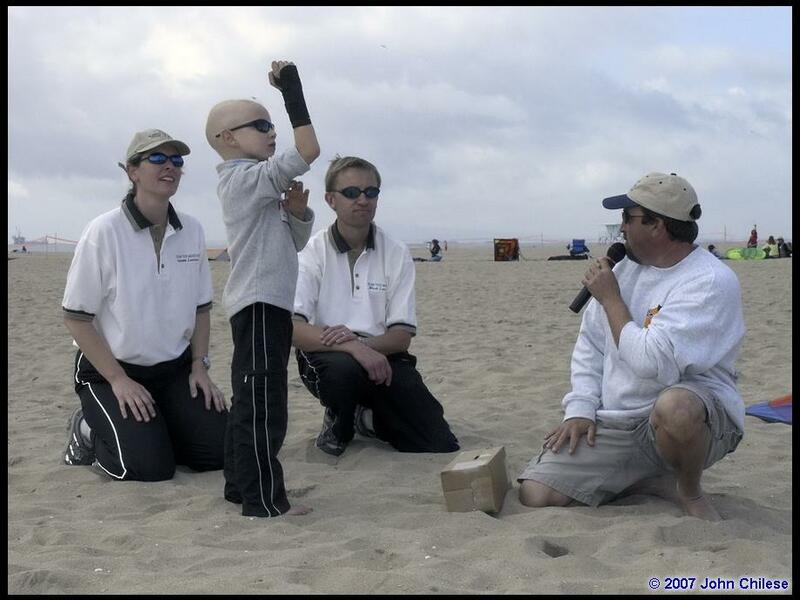 Following that, Dave Shenkman called Ben over and introduced Ben to the audience, even interviewed Ben a little, and explained that Ben had cancer, and asked for the audience’s help. 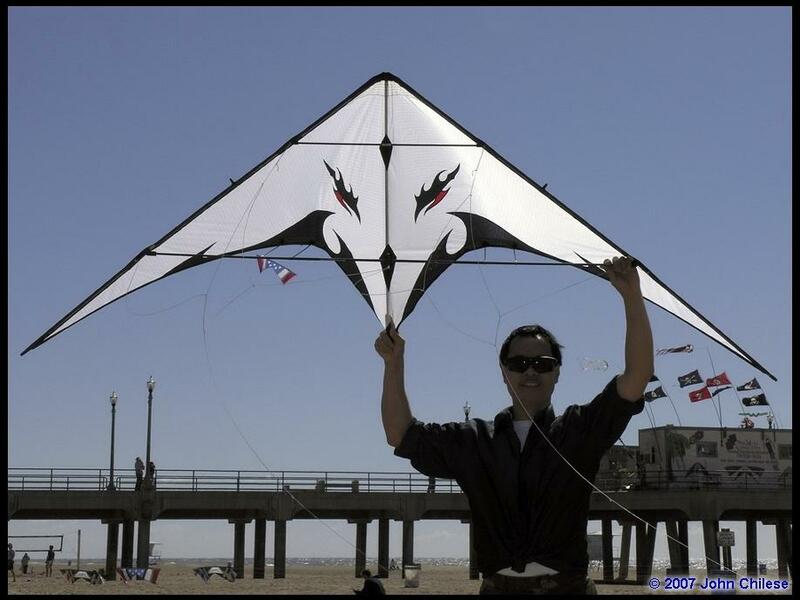 Dave had acquired 100 small delta kites with big “smiley” faces on them. 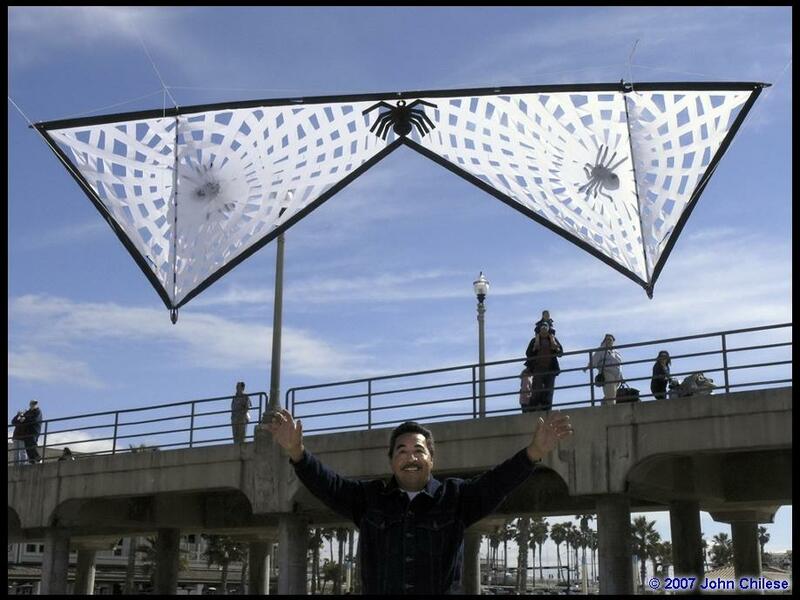 Dave would sell these kites for $20.00 apiece, and asked the audience to come up and place their $20 bill in a box and he would give them a kite to fly in exchange. 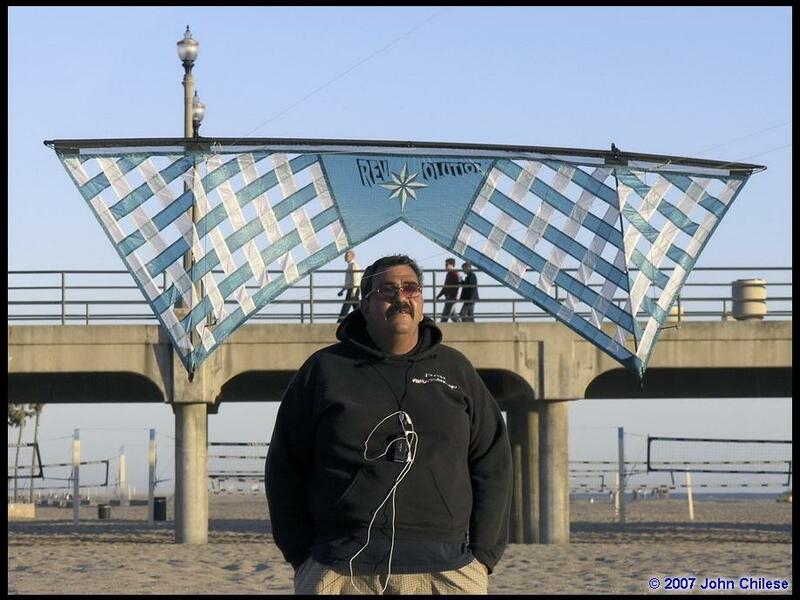 The field was officially open for the “Smiley Kite Mega-Fly” and Dave would not stop selling the kites until they were gone – and the ENTIRE proceeds (everything in the box) would go to the Lummas family to help defray Ben’s medical expenses. One of the first purchases went to another small boy from the crowd who was about Ben’s age (and whose name I didn’t get) who paid Dave his $20 and happily went out to fly his new kite! 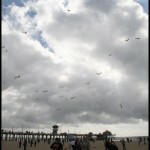 And before very long… the sky was filled with 100 “Smiley Faces” – all up there for Ben’s benefit! But you could not convince me that the crowd wasn’t having fun as a part of the process. 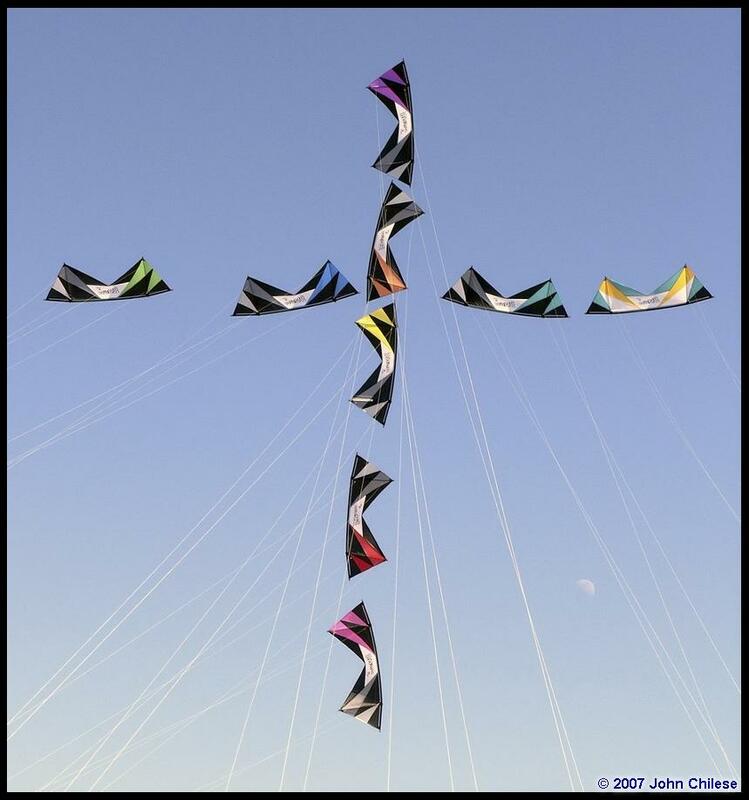 Rather than just putting their money in the box and launching the kite for a few minutes – those “Smilies” flew very well, and held the field for at least half an hour – and several of them hung “up there,” smiling down at us nearly to sunset. 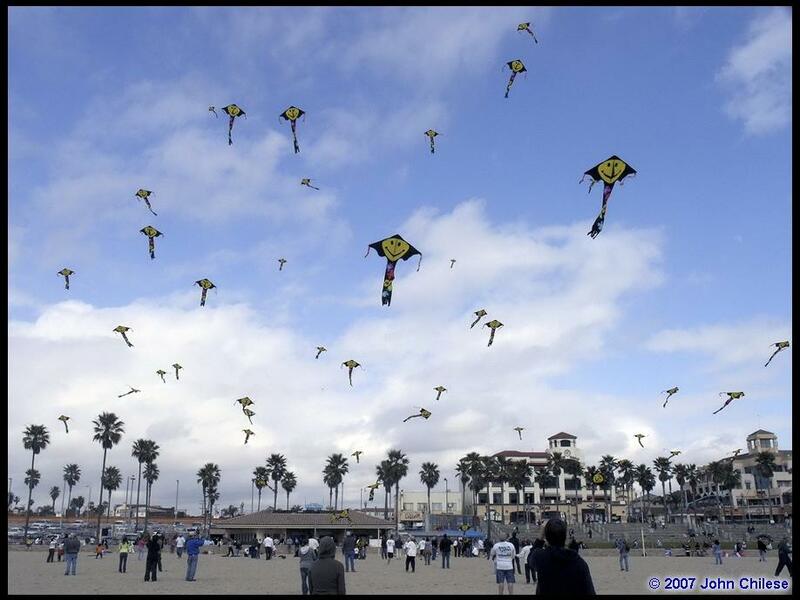 Indeed – though I’m sure it wasn’t envisioned at the time, this magnificent “Flight for Ben” would be the unofficial end-cap to all of the equally unofficial fun – of Kite Party #5. And, as a footnote, I gave Dave Shenkman another $20 bill, and asked him to send a “Ben’s Smiley Face” delta on to Shelly Hill – Shane Hill’s wife. 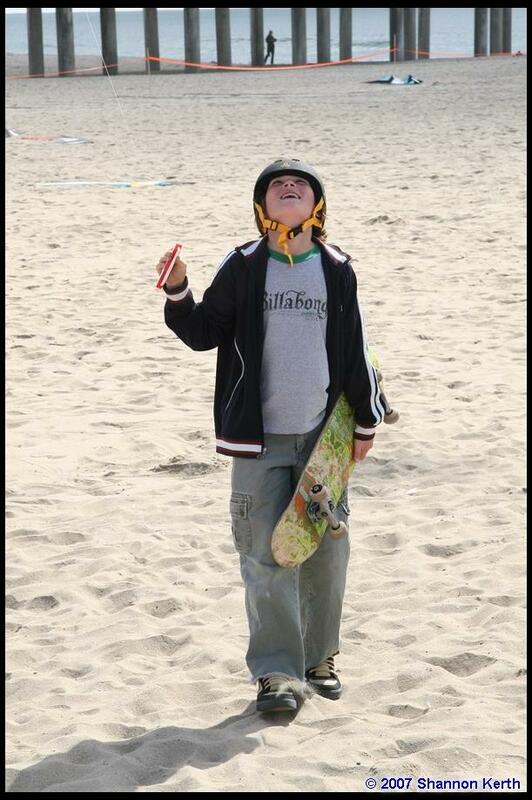 If Shane had been present, he’d certainly have been among the first people in line to buy a Kite in Ben’s behalf. Shane was just that kind of guy! Yes, some sadness visited KP #5 early on, but there was also a good portion of hope at the end, too. Monday morning broke… aw, never mind! 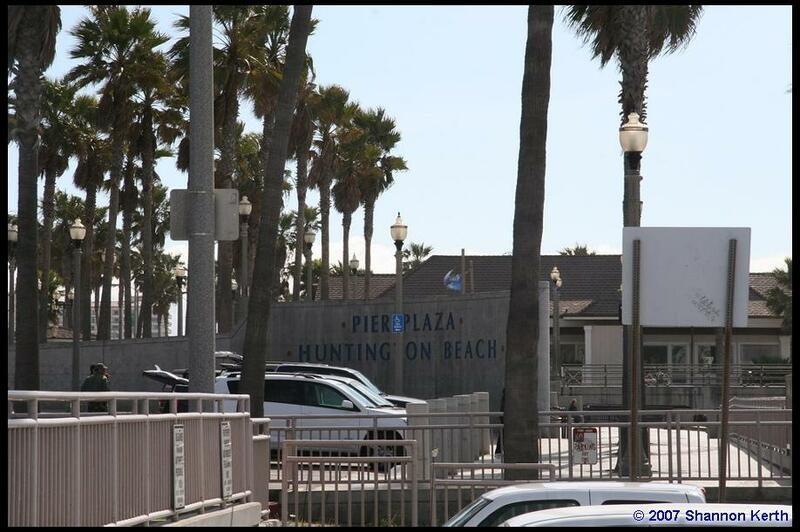 You all know how it is in Huntington Beach! And if you don’t know first hand, maybe you should start sawing a few bucks a month and plan to show up for Kite Party #6 next year. But it was a “travel day” for those of us who’d stayed over until Monday. Jim Cosca from Premier back on the east coast had a mid-day flight, so we all had time for a leisurely breakfast. Ron Gibian and I joined him again (Ron would drive north to Visalia, and I would drive south to Poway), but Mark Reed was nowhere in evidence. A quick cell-to-cell call found that Mark was out visiting friend Rachel (she of the lovely, modified Quantum Pro) at her Physics Lab at UC-Irvine, but he would join us later on. 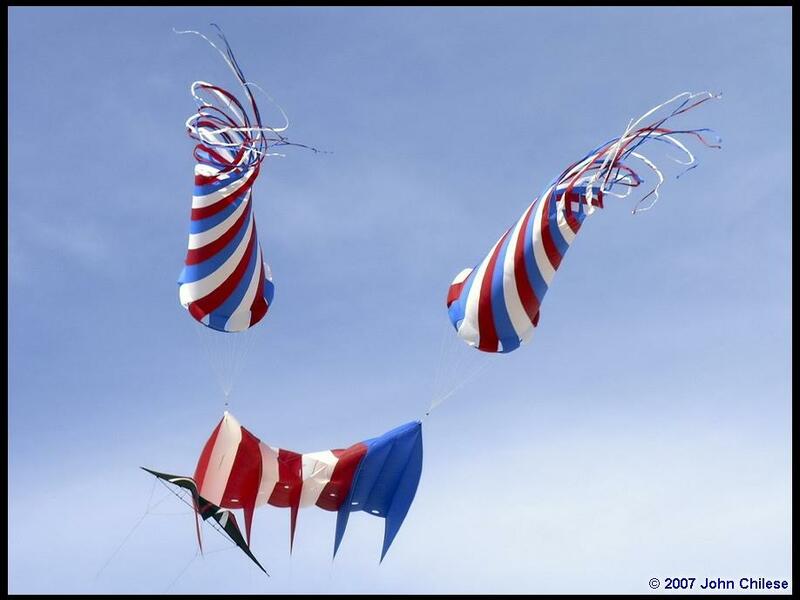 This entry was posted in 2007, Issue 53 (Mar/Apr), KL Archive and tagged festival, kite party.